Die Treiber funktionieren unter 32 und 64 Bit Windows 7 und Vista. Wie überprüfe ich die SICL-Installation? First of course you have installed the drivers from the floppy disk, and SICL is installed, and also BASIC is installed. Also you have to configure the interfaces within SICL. Each interface needs to be associated with its own file in the HP BASIC directory (typically C:\Hpbasic). The system starts out with one copy of HPIBS.dw6 and one copy of GPIOS.dw6. If you have two HPIB interfaces, you will need to make a copy of the HPIBS.dw6 file for the second card. It must have the .dw6 extension, but it can have any name. It is often easiest to name this file in a way that identifies which interface it will be used with. For instance, if you have an interface with a logical number 7 and have named it hpib7, you might want to associate it with a copy of HPIBS. dw6 that is called HPIBS7.dw6; vary it to best suit your needs. The same procedure holds for GPIOS.dw6 files. Before the card can be used, you must associate the .dw6 driver with the SICL name. You have the option of specifying what select code you would like to use. The binary must loaded exactly once each time the BASIC window is invoked, so it is a good idea to write an AUTOST program that loads the binary. However, the loading can be done from the command line, or from within an application program. LOAD BIN "HPIBS;DEV hpib7 ISC 7"
If the command completed, you will see a confirming message indicating the HPIBS driver and version. Otherwise you will get an error. Substitute the logical name you gave the interface in the SICL configuration utility, if it is not set to hpib7. LOAD BIN "GPIOS;DEV gpio ISC 12"
Again, you will either get an error or you will see confirmation that a binary was loaded. 20 LOAD BIN "HPIBS;DEV hpib7 ISC 7"
30 LOAD BIN "GPIOS;DEV gpio ISC 12"
This program can be saved or stored in the same HPBASIC directory. 30 IF I=3 THEN PRINT "GPIO IDENTIFIED"
Any nonzero sent here resets the interface. Any nonzero sent here sets the line. However, you must disable auto handshaking first. See Register 6. Setting bit 0: enables auto handshaking. Clearing bit 0 disables auto handshaking. This must be done before taking control of PCTL, for instance. Wie konfiguriere ich ein TAMS 6x622 Interface mit 98622A Standard-Einstellungen? Read Clock --> DON'T CARE it is a printer! The following is an example of the 61622 configuration dialog box in Windows with the default values. There are, however, a few things you need to do to insure a successful installation. You must install the Agilent IO Libraries before continuing! Install the 60488 HPIB cards into the system, then install the 60488 Windows driver that is appropriate for your OS. You only need to perform the driver installation once. Install the 61622 GPIO cards into the system, then install the 61622 Windows driver that is appropriate for your OS. You only need to perform the driver installation once. 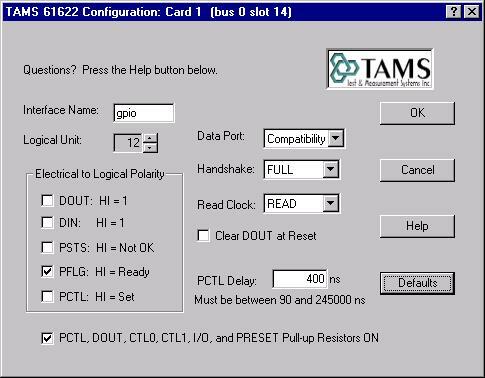 Reboot and make sure you can see the cards in Device Manager (2000/XP only) under TAMS GPIO interfaces. The system will take a while to reboot because the plug and play manager needs to enumerate all GPIO cards one by one. Once it is done, the next time you boot, the machine will boot normally. After you have installed all the cards, run IOconfig and give a unique name and address to each HPIB and GPIO card in your system. For each 60488 HPIB card, you need to create an incremental copy of the file named hpibs.dw6 in the HTBasic directory. You can include all this initialization in the file autost in HTBasic and it will happen automatically every time you start HTBasic.